Alien Matian, the Internet through the eyes of a dog. Welcome to the Alien Matian. Do not ask to be taken to our leader, he is busy right now, eating everything in sight. No, his name is not Jabba the Hut, although he can eat just as much. The great ones name is Jackson. He is Dalmatian-king of The United Nations of the Alien Matian. If you are looking for someone to blame for the total insanity of these pages, look no further than our spotted and hungry leader. 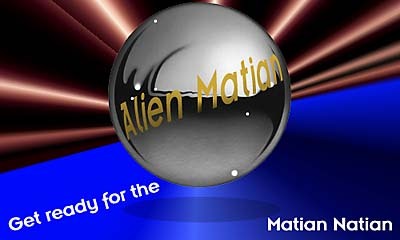 Find out about the curious and spotted breed in the Alien Matian Classroom featuring a History Lesson not to be soon forgotten. It is a long time ago, and the minutes is very different than our own. It is a mysterious place, one where the dog food flows freely, and every tree and bush is open for watering. This hideous place exists inside the brilliant and curious head of a dog. A Dalmatian to be exact. This is his world, and when you are in it, you must always do what he says... or else. From this point on, you will be guided through the treacherous and tricky world of Alien Matian by none other than the gatekeeper himself, Jack.